I caught part of the 2-hour Nelson Mandela special on “Q” this morning, where the interviews were punctuated with some wonderful songs. There are lots of books about Mandela at Robarts and other U of T libraries, including his autobiography, Long Walk to Freedom. And for a more Canadian perspective on the events behind Argo, in our regular collection we have: Our man in Tehran : Ken Taylor, the CIA and the Iran Hostage crisis. 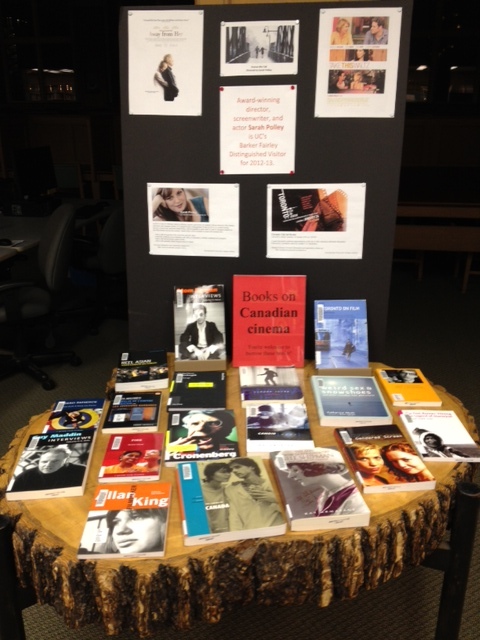 Speaking of movies, here’s a photo of our recent display about Canadian film books and this year’s Barker Fairley Distinguished Visitor, Sarah Polley. Today is World AIDS Day. Here’s a photo of a small display we’ve had at the front of the UC Library for the past week or so: books about AIDS (including some drama and fiction) . This Thursday (Sept. 27) at 2:30 there’s a lecture at U of T’s East Asian Library by Arlene Chan, the author of the book Chinese in Toronto from 1878: From Outside to Inside the Circle (which we have at Laidlaw Library). The lecture’s at the Cheng Yu Tung East Asian Library (8th Floor, Robarts Library). Admission is free, but limited seats are available — please contact Lucy Gan if you’d like to attend (lucy.gan@utoronto.ca / 416-978-1025). Girls Fall Down by Maggie Helwig has been chosen by Toronto Public Library as this year’s “One Book” — the novel for Torontonians to read in April — and Laidlaw Library now has five copies ready to be borrowed! And one of this year’s “One Book” events will be a lecture by Andrew Lesk at University College: “Unseen Toronto: The Shadow Worlds of Girls Fall Down” (April 26 at 6 p.m., room 179).